Port a number to MetroPCS and get up to $150 off a new phone. Requires activation on the $50, $60 or 4 for $100 Unlimited plan. Port a number to MetroPCS and get a free iPhone SE. Add a second line and get a second free iPhone SE. Requires activation on the $50, $60 or 4 for $100 Unlimited plan. Limit two free iPhone SE's per account. Buy one iPhone SE and get a second iPhone SE free. Both phones must be activated on any MetroPCS. Both new customers and current customers upgrading to an iPhone SE are eligible. Add a line to an existing MetroPCS account and get half off any Android phone priced at $180 or less. Limited to two upgrades per account. Four lines of Unlimited for $100. Service is on the $50/month plan with video streaming throttled to 480p and no hotspot. Requires at least one port in. 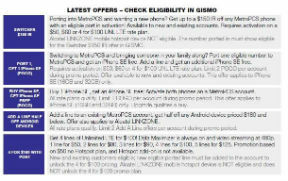 New and existing customers eligible. Compared with Metro's current promos there's good news and bad news. 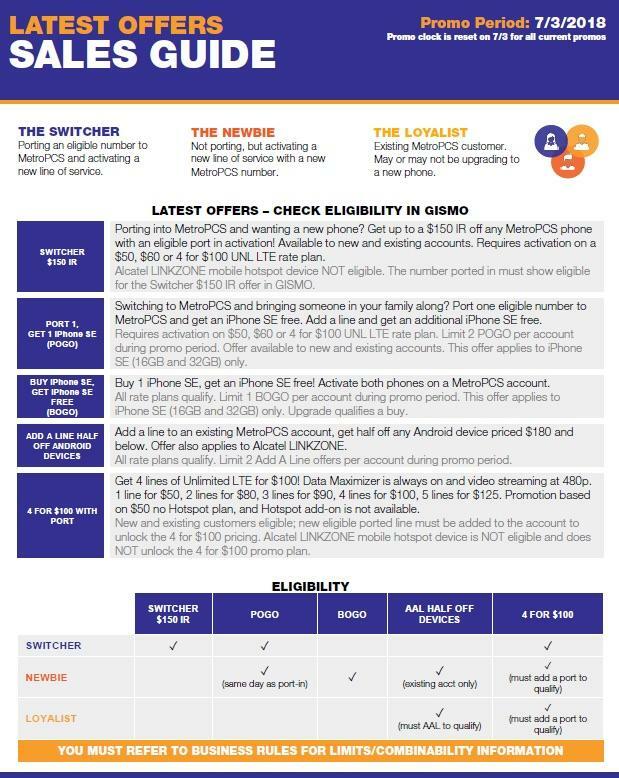 The good news is that the popular 4 lines of unlimited for $100 offer is not ending. Also, the half off any Android phone and buy one iPhone SE, get a second one free offers appear to be new. The bad news is that the offer that let you port one number, add three lines and get four free iPhone SE's or up to $150 off any other four phones is ending. It's replacement is limited to only two free iPhone SE's. Still not much love for existing customers. I've been with MetroPCS for 5 years and I guess loyalty isn't really rewarded much. Oh well ... that much said, I am going to run out and get the new LG Stylo 4 so I can take advantage of the 600mhz bands. I just looked at the LG Stylo 4.... WHAT? 2GB of Ram? What is this with a phone that has the way out of date (and woefully inadequate) RAM standard from 2011 while it has the 600 MHZ cell phone band of tomorrow? It's like Fred Flintstone flying in the Jetsons car, man! Metro's not worth it now that they lock down their phones for 6 months. You can pay to have it unlocked on ebay whenever you want. MetroPCS is the #1 prepaid brand in the USA, so it is certainly "worth it." Ya good luck getting anything unlocked other than a ZTE or LG for under $100. If MetroPCS reverted to a 90-day phone lock, they would have to raise prices to cover their costs for the phones. And then the phone flippers would not buy anyway. What Metro 'really wants' is to get more subscribers, and low-priced phones is one good way to do that. That is why I thought 90 days was optimal, it was long enough to discourage the flippers, but not so long that someone interested in getting a new phone would be driven off. Our TMO phones are just getting older while we are waiting for a good offer to jump on. I paid $15 to unlock a j3 prime a while back. I assume that only the Cricket variant will have VoLTE and HD Voice on AT&T. Metro/T-Mobile service is not consistent. Sometimes I would not get any service though I am in a strong MetroT-Mobile coverage area. I had to switch to Cricket and I never have any problems. The areas where I never got service with Metro/T-Mobile, I can have great coverage. Yeah, but you're stuck with slow throttled speeds, so its the same as Metro. Plus Metro technically has more LTE coverage. I'd rather not give ATT any money since given their history of anti-consumer practices (price hikes, NSA, anti-net neutrality). Fact check. T-Mobile's NATIVE coverage area is much smaller than AT&T's. Even if it is slow/throttled, I get service everywhere to make and receive calls and I can even watch videos on 3mbps download/uploads. Metro/T-Mobile service is not usable at times. I know I was saving money when I was on T-Mobile Military plan with Netflix but it was of no use when I needed service. I myself don't like big telecoms like AT&T and Verizon but T-Mobile still has sparse service especially in the suburbs and they are working really hard to fill the gaps. "Yeah, but you're stuck with slow throttled speeds, so its the same as Metro. Plus Metro technically has more LTE coverage. I'd rather not give ATT any money since given their history of anti-consumer practices (price hikes, NSA, anti-net neutrality)." Aren't ALL the carriers against net neutrality? If your standards are such that you won't go with a carrier that opposes net neutrality, I hope you are cleaning up a couple of old Campbells soup cans, and ordering a huge ball of string on Amazon. Because that's going to be the only way you can make calls and avoid net-neutrality-hostile carriers. If Metro wants my business they will stop charging for hotspot on their unlimited plan. Boost includes hotspot. Boost may include hotspot. But then you're stuck on the Sprint network. And besides, the MetroPCS hotspot add-on is only $10. "Boost may include hotspot. But then you're stuck on the Sprint network." Maybe all Sprint hotspots can be called lukewarmspots. There's nothing "hot" about a hotspot that can pump 0 mbps data from a dead network to any number of connected wifi devices. $10 per line. The four $50 lines are discounted 50% to $100. Instead of discounting four $60 lines to $120, Metro charges $150. Why anyone would choose this over Tello, must be because they have no coverage. Metro is otherwise NOT a deal. 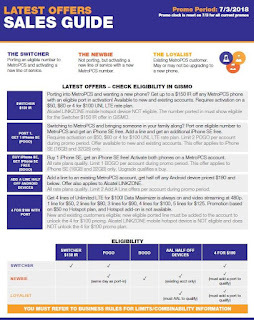 Why choose MetroPCS over Tello? The biggest reason is that they actually want to use their phone. Tello's Sprint network gives you no signal at all in most of the US, and a lot of that Sprintless territory will let you use your T-Mobile-based MetroPCS phone... it's a much larger network. Then also Tello is one of those-smells-funny fly-by-night MVNO's that might suddenly go out of business with 6 days notice, taking your phone number with you and leaving you high and dry. It happens a lot in this sector. And there's no way MetroPCS is going away: if its parent company T-Mobile ever went bankrupt, you'd find out about it at least a couple of years before it happened. So there you have it. MetroPCS is for those who actually want to use their phones and have the company around for a while. Tello falls well short. If it is a primary phone, I would choose ATT Prepaid>TMO Prepaid>Metro. I would use Metro only if I needed a new phone and only of their is a corporate store nearby. If it is a glovebox or backup, Lyca or Tello is my choice. Stylo 4 or iPhone SE? What day will metro pcs will Launched their Prepaid Phones and The Iphones At Metro pcs late 2018 this Year.